The 311th Air Division is an inactive United States Air Force organization. Its last assignment was with Strategic Air Command at Barksdale Air Force Base, Louisiana, where it was inactivated on 1 November 1949. The division was first activated in 1944 as the 311th Photographic Wing. Although it was stationed in the United States, throughout its existence, the unit was responsible for the control of long range reconnaissance units in multiple theaters. The 311th first came into existence in February 1944 as the 311th Photographic Wing at Bolling Field in Washington, DC and was assigned to nearby Headquarters, Army Air Forces. Initially, the wing acted as a task force headquarters with no permanently assigned units. In March, the 1st Photographic Group at Peterson Field, Colorado and the 11th Photographic Group at MacDill Field, Florida, were assigned to the wing. These two groups had squadrons performing mapping and charting functions in the US and in overseas theaters. In October 1944, the two groups were disbanded, and their squadrons were assigned directly to the 311th Wing. The flying squadrons transferred to the wing were the 1st, 2d, 4th and 19th Photographic Charting Squadrons; the 6th and 16th Photographic Squadrons and the 91st Photographic Mapping Squadron. Little more than a month later, the wing moved to Buckley Field, Colorado, which had become the home of the 1st Group in July. However, the wing served as an administrative headquarters for its mapping and charting units, with operational control resting with other headquarters. The 1st Photographic Charting Squadron was soon reassigned to Second Air Force and began to train with the Boeing F-13 Superfortress. Although it returned to the wing in 1945, it was then stationed in Okinawa and under the operational control of other headquarters. Although it remained assigned to the wing until 1947, the 2d Photographic Charting Squadron was already in the process of deploying to the Southwest Pacific Theater when it was assigned in 1944, and was detached to Far East Air Forces the entire time it was assigned to the wing. The 4th Photographic Charting Squadron also deployed to the Southwest Pacific and was attached to headquarters there until it was inactivated in April 1946. The 19th Photographic Charting Squadron headquarters remained in the United States. However, its air echelon was located in Egypt until January 1945. In May 1945, the squadron's air echelon moved to Accra, Gold Coast (now Ghana) to begin mapping Africa with its Boeing F-9 Flying Fortresses. The air echelon moved to Europe and was joined by the remainder of the squadron in June 1945, engaging in mapping activities in Europe under the control of Ninth Air Force until inactivating in December 1945. Like the 19th Squadron, the headquarters of the 91st Photographic Mapping Squadron remained in the United States. However, the squadron's flights were involved with mapping operations in South America and it maintained flights in Talara, Peru until 1944, then at Atkinson Field, Trinidad, Howard Field, Panama and Natal, Brazil. In August 1946, the squadron moved to Panama and was assigned to Caribbean Air Command. The 6th Photographic Squadron, which was a photographic compilation unit located at Jefferson Barracks, and the 16th Photographic Squadron remained in the United States under the wing's control. In July 1945, the wing and its mapping squadrons replaced "Photographic" in their names with "Reconnaissance", reflecting the fact that its deployed units performed reconnaissance missions for overseas headquarters in addition to the mapping and charting missions they were deployed to perform. The Army Air Forces had formed Continental Air Forces in December 1944 as an intermediate headquarters for its four Numbered Air Forces and I Troop Carrier Command, which had been assigned directly to Headquarters, Army Air Forces. In December 1945, the wing was also assigned to Continental Air Forces. Following the end of World War II, The Army Air Forces reorganized its combat forces into Strategic, Tactical and Air Defense Commands in the spring of 1946. The 311th Reconnaissance Wing became part of Strategic Air Command (SAC) in this realignment. The wing and the units still assigned to it moved to MacDill Field, Florida in April 1946. MacDill had been a training base for reconnaissance units, and the 89th Reconnaissance Training Wing had been inactivated there earlier in the month. Upon this reorganization, the wing became SAC's primary reconnaissance organization. Although postwar reductions had resulted in the inactivation or reassignment of a number of the wing's original squadrons, the wing briefly assumed responsibility for the Army Air Forces' weather reconnaissance units. This began with the transfer of the 1st and 3d Weather Reconnaissance Squadrons at Grenier Field in February 1945. The 1st was inactivated in late 1945, but at that time the wing added the 54th and 55th Reconnaissance Squadrons, Very Long Range, Weather on Guam from Twentieth Air Force and the 59th Reconnaissance Squadron, Long Range, Weather from Third Air Force. 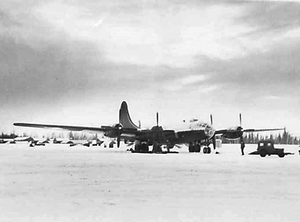 By March 1946, however, it was decided to assigned responsibility for weather reconnaissance to Air Weather Service and these units were transferred to it. Two former B-29 bombardment squadrons assigned to SAC bombardment groups, the 6th and 10th Reconnaissance Squadrons, were transferred to the wing in March 1946, but both were inactivated at the end of the month. In 1947, the wing was assigned groups for the first time since the 1st and 11th Groups were disbanded in 1944. In February, the 55th Reconnaissance Group was activated at MacDill and assigned to the wing. In October, the 91st Reconnaissance Group, which had been recently activated at McGuire Air Force Base, New Jersey was also assigned. The 55th Group focused on mapping operations, particularly for SHORAN and HIRAN navigation systems. In 1947, the Air Force began to experiment with the wing base reorganization, which assigned operational groups and support organizations on individual bases to a single wing headquarters. In 1948, this reorganization was made permanent and wings like the 311th, which had groups at multiple bases became divisions. The wing became the 311th Air Division and its 55th and 91st Groups now reported to the new 55th and 91st Strategic Reconnaissance Wings. The division's mission was to develop, test, and improve the equipment, tactics and techniques of strategic reconnaissance; to train replacement aircrews for SAC and overseas commands. It produced target charts, maps and related materials for SAC. As the headquarters for Aeronautical Charting Service, it was responsible for targeting charts and maps, in particular for SAC. Through April 1948, the bulk of the division's assets were involved with Operation Sandstone, nuclear weapons tests at Eniwetok Atoll. The division and the 55th Group moved from MacDill to Topeka Air Force Base, which had been reopened to receive them in July 1948. During the Berlin Airlift, elements of the division produced documentary coverage of airlift operations in Berlin. The May 1949 Air Force Reserve program called for a new type of unit, the Corollary unit, which was a reserve unit integrated with an active duty unit. It was viewed as the best method to train reservists by mixing them with an existing regular unit to perform duties alongside the regular unit. In June 1949, the division added the responsibility to train reservists to its mission, when the 66th Strategic Reconnaissance Group, was activated at McGuire Air Force Base, New Jersey and assigned to the division as a corollary unit of the 91st Strategic Reconnaissance Wing. Despite adding two new wings in 1949, the 5th Strategic Reconnaissance Wing at Mountain Home Air Force Base, Idaho, and the 9th Strategic Reconnaissance Wing at Fairfield-Suisun Air Force Base, California, the wing was impacted by President Truman’s reduced 1949 defense budget which required reductions in the number of units in the Air Force. [note 1] Forbes Air Force Base (the new name for Topeka Air Force Base) was scheduled to close and the 55th Wing there was to inactivate. Mountain Home Air Force Base was also on the closure list and the 5th Wing was scheduled to merge its operations with the 9th Wing at Fairfield-Suisun. McGuire was transferred to Continental Air Command, and the 91st Wing moved to Barksdale Air Force Base, Louisiana on 1 October. In late October the division joined the 91st at Barksdale, where it inactivated on 1 November 1949, while its personnel and equipment were transferred to Second Air Force, which was simultaneously activated. Strategic Air Command, 31 March 1947 – 1 November 1949. ^ a b c d e f g h i j k l m n o p q "Factsheet 311 Air Division". Air Force Historical Research Agency. 5 October 2007. Archived from the original on 30 October 2012. Retrieved 26 March 2014. ^ McGrew. "Combat Chronology of the USAAF: February 1945". Rutgers University. Retrieved June 1, 2017. ^ a b c d e "Abstract, History 311 Air Division Apr 1948". Air Force History Index. Retrieved June 4, 2017. ^ "The History of Forbes Field (IATA: FOE; ICAO: KFOE) Metropolitan Topeka Airport Authority". Combat Air Museum. 2008. Retrieved June 4, 2017. ^ "Abstract, History 311 Air Division Jun 1948". Air Force History Index. Retrieved June 22, 2017. ^ "Abstract, History 311 Air Division May-Oct 1949". Air Force History Index. Retrieved June 5, 2017. ^ "Abstract, History 311 Air Division Sep-Dec 1948". Air Force History Index. Retrieved June 5, 2017. ^ "Abstract, History 311 Air Division Jan-Jun 1949". Air Force History Index. Retrieved June 4, 2017. ^ a b c Components in 311th Air Division Factsheet, except as otherwise noted. ^ "Abstract, History 4201 Motion Picture Squadron Aug 1948". Air Force History Index. Retrieved June 22, 2017. ^ Robertson, Patsy (February 10, 2010). "Factsheet 2 Combat Camera Squadron (AFPAA)". Air Force Historical Research Agency. Retrieved June 22, 2017. Markus, Rita M.; Halbeisen, MSG Nicholas F.; Fuller, John F. (1987). Matthews, James K.; Gustin, Joylyn I., eds. Air Weather Service: Our Heritage 1937-1987 (PDF). Scott AFB, IL: Air Weather Service. OCLC 18406969. Retrieved June 10, 2017. Mixer, Ronald E. (1999). Genealogy of the Strategic Air Command. Apopka, FL: Battermix Publishing Company. Mixer, Ronald E. (2006). Strategic Air Command, An Organizational History. Apopka, FL: Battermix Publishing Company. ASIN B0006RK1OW.